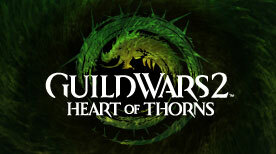 What’s New with the Heart of Thorns? A new class called the Revenant, balancing the armor classes as it adds to the heavy armor class. Its skills revolve around using the power of Guild Wars legends past. You can use the power of the dwarf, demon, centaur, assassin, and dragon legends. Each of them grants skills for a specific function such as tanking, DPS, healing or utility, making it a very versatile class. The expansion adds elite specializations for all classes, giving the ability to equip previously unusable weapons, as well as granting additional skills and abilities. In addition to those, Guild Halls are now available, a feature from the first game. Guilds can now claim an area in the Heart of Maguuma and build one there. Also, four new open maps are now open to be explored as well new dynamic event system features called Outpost and Adventures. Then, the game introduces a new PvP mode, Stronghold, and a new map for World vs World, Desert Borderlands. Lastly, and my favorite addition, the expansion allows the use of gliders from certain spots on the map. This is a very useful thing, as some jumping puzzles bring you high up with not so easy methods of coming back down. Get it from their own website, or buy CD keys from other players. The latter is cheaper than the former, but however you got your game, enjoy traveling and adventuring in the land of Tyria!